If you need to improve handicapped accessibility in your home or business, you may be wondering whether there are any alternatives to a stair lift. Here is a brief index of some accessibility alternatives and their advantages and disadvantages. The primary advantages of stair lifts are their simple design, quick installation (less than two hours in most cases), and low price. For additional information on any of our product offerings, call our accessibility experts at 1 (800) 791-6819 now. Or, click here to contact us via email. 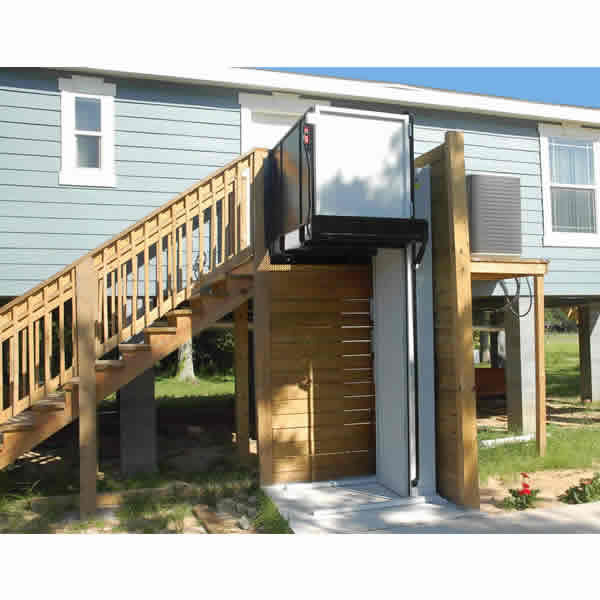 Vertical Platform Lifts - These are platform lifts that travel vertically only. They are similar to elevators but are usually open air structures rather than being enclosed in a shaft like a traditional elevator. They are typically used at building entrances and raised platforms to provide wheelchair access. Advantages over stair lifts: Vertical lifts can be installed in places where a stair case is too short or too narrow for a stair lift. May be installed as an alternative to a curved stair lift. Vertical platform lifts allow you to travel on a wheelchair or a scooter. Disadvantages over stair lifts: A VPL is a more expensive solution than a stairlift. Extensive construction to your home may be required to properly secure the platform lift to a wall or to comply with your state's building codes. Incline Platform Lifts - These are platform lifts that travel along stair cases. They are similar to stair lifts, but have a platform that can transport a wheelchair or a scooter. They are typically used in commercial locations such as schools, public assembly buildings, and government or municipal buildings which have wide stair cases that accommodate many people. Advantages over stair lifts: Incline platform lifts will let you travel on a wheelchair or a scooter up and down an existing stair case. Disadvantages over stair lifts: Incline lifts cost more money and require much wider stair cases than those found in most homes. Elevators - The tried and true solution to moving people around in a building. Advantages over stair lifts: An elevator provides better accessibility for a wheelchair or a scooter. Disadvantages over stair lifts: An elevator will cost significantly more money and take longer to install than a typical stair lift. It almost always requires major modifications to your home, and much more maintenance is required to keep an elevator running properly than for a stairlift.